For the last two weeks we have been cleaning out landscape beds, training wandering Wisteria along trellises … and raking, raking, raking! With our beautiful shade trees, there are a LOT of leaves! (: This mountain of leaves is just one our many heaps we burned from the gigantic pile of leaves Richard raked up! With all the debris we cleaned up, it’s hard to believe this is just the “remnants” or leftovers, after all our autumn raking! 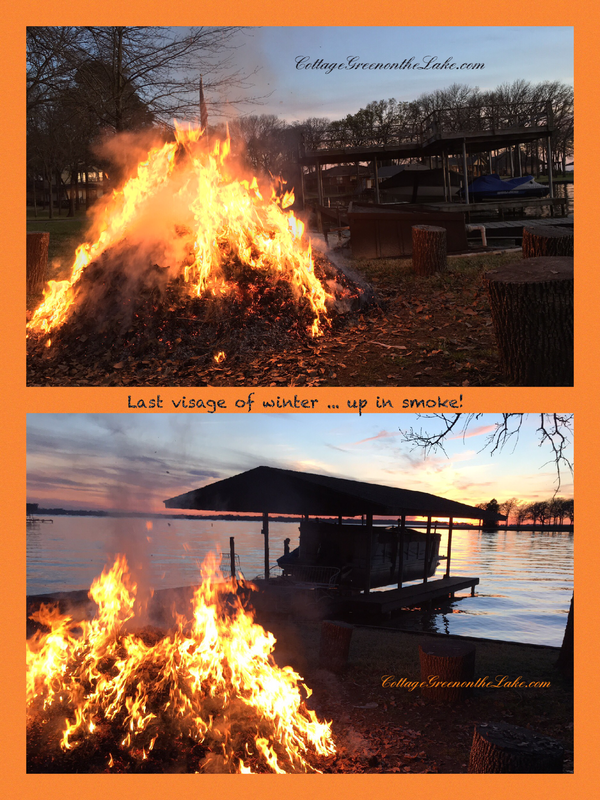 After our day of work, we sat in the twilight and enjoyed watching the last embers glowing … gazing as the last visage of our winter went up in smoke! Inside the cottage … spring cleaning and decorating continues. (: I love this time of year and bring out my collections of birds and little nests filled with eggs. You can find them perching in unexpected places, peeking out of nooks and crannies, and on tabletop vignette’s. Down the staircase is a favorite picture … “The Lord is my Shepherd” and a metal vase filled with fragrant eucalyptus and peacock feathers. A little alcove under the hall tree … another perfect nesting spot! “Bird watching” (; … this vertigo green bird blends beautifully with the green shades of this collection of antique dishes from England. Antique dishes on the lower deck … “The Old Curiosity Shop” by Currier and Ives. A nest entwined with spring buds and new leaves is perched on a miniature bird bath filled with millet. Little birds stand guard on a cake plate watching over two sweet eggs nestled on a bed of moss. A mercury glass bird and a fairy tale toadstool look charming together, sheltered under the glass canopy. A blown glass cloche with a bird “finial” covers a little nest holding a glittered acorn. A silver bird perches on the edge of his nest … the perfect cache for a little treat of birdseed! (; The color of the millet matches the hues in the painting above and the in-laid wood of the tea cart. A beautiful azalea from our own front yard almost “glows” in an antique bird planter. Under a “twiggy” lamp with a little wire nest ensconced in it’s branches, a cloche covers a pair of sweet owls and a moss-lined nest filled with speckled eggs. Thank you for spending some time with me today! Please click on the box marked FOLLOW in my blog above to have each new post delivered directly to your e-mail address. I’m joining Chloe Crabtree with Celebrate & Decorate (click here) and Lynn from The Vintage Nest (click here) for other great decorating ideas and DIY projects!